One day, we went to the local craft superstore to get some jeans fabric to patch up Hugh's favorite pair of jeans, which were going a bit see-through in the crotchal region. 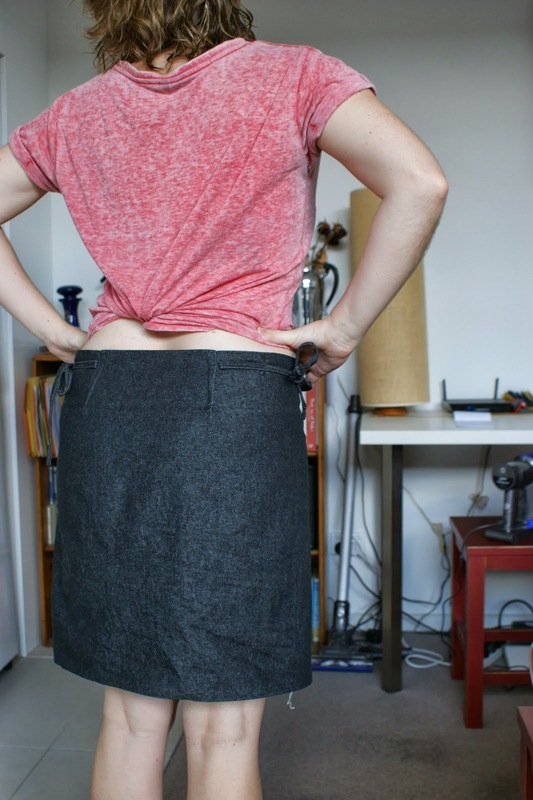 He bought half a metre, which was way more than he needed, so after he patched up his jeans, he decided to make a skirt. Two hours later, I had a new wrap skirt! How crazy is that? How did I land myself such a talented man? He didn't use a pattern or anything. He just winged it. And it's not a simple rectangle of fabric, wrapped around my waist. It has shaping and detailing and a hole to thread the side-tie through! I love it. He makes a mean nacho plate as well! Lucky girl.